Graeme Rigg and James Kell, On-Wing Capability Team, Rolls Royce. Ben - We return now to our topic of sensors and sensor technology. 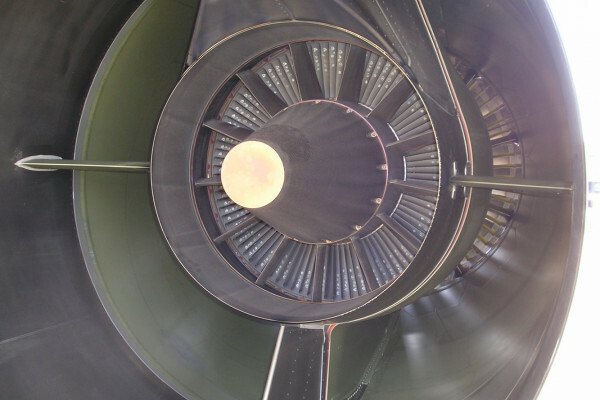 But rather than sensing a natural system such as the soil or the atmosphere, we're going to explore the technology needed to see inside a very man-made environment, a jet engine. Rolls Royce engines are regularly inspected to keep them in tiptop condition and running efficiently. The job of getting inside to check them over falls to the on-wing capability team. I met James Kell who develops the tools and manager Graeme Rigg. Graeme - Our key challenge really inside an aero engine is the fact that generally, the access ports to get inside are very small, sub 9.4 mm. The route through blades and vanes are quite torturous sometimes if you want to view something that's none routine. Also, the engine runs at very high temperatures so we've got quite a hostile environment as well. So if we want to leave something permanent in there to monitor, that's always going to be difficult. So we try and inspect the engine when it's on the ground, and when it's cooled down. Ben - Why do we need to avoid just taking the engine off, opening it up, stripping it down, checking it all out and then putting it back on? Graeme - One of the key things we're here for is to keep engine on-wing as long as possible. It's very costly to remove an engine from wing. It's very disruptive to the customer. One of the key things is that an aircraft has a schedule and might have 300 people waiting to fly out somewhere, and if it's stuck on the ground, then that's obviously quite serious and quite disruptive. So we want that engine in perfect condition so that they can take off on schedule, at the right time, and keep the customer happy. Ben - So how does this on-wing testing using these tiny access ports, how does that fit in with the general life of an engine? Graeme - There is always schedule maintenance of engines, so they're removed periodically and put through the overhaul facilities where they're stripped down to detailed parts and completely refurbished. The bit that we're interested in is whilst they're on the wing, in between those periods, so that we can make sure that the engine is in its optimum operating condition, we don't cause any delays and that we can actually see inside the engine and monitor the condition of it. Ben - What are the sorts of things that we actually need to monitor inside an engine? Graeme - Generally, we're looking at the rotating components so that'll be the compressor blades and turbine blades. We can inspect those using our borescope equipment. Ben - It sounds that you actually have a lot in common with surgery and in particular keyhole surgery where you need to do very delicate procedures through tiny access holes. Can you share some of the technology? Graeme - A lot of the technology we use is developed from surgery from the medical industry. A lot of the companies we use predominantly are medically based. We use borescope equipment or enteroscopes, so we can actually see through a camera inside the engine, and see rotating components to make sure that they perform as they should. At other times, we have to go in and we have to clean things, we look inside oil systems sometimes to make sure there's no carbon. There's the routine areas which will be the gas stream which is turbine and compressor blades and then there's non-routine things which is where it becomes more surgical and more difficult because the routes in are always very difficult, and sometimes have to go in through pipes and other components. Ben - With surgery of course, we can make an incision where we need to in order to go in and access things. With an engine, I guess, once it's built and once those access ports have been put in, then we have no choice but to use those. Does this get thought about in the initial design? Are you pushing to make sure that you'll have the access you need? Graeme - Yeah, we sit in the design meetings and we specify that we would like access to both sides of each turbine and compressor blade. Sometimes due to the complexity of the design, that's not always possible and that's where we have to develop specialist techniques to get into more difficult areas. We do feed in to design and we are having more influence as we have more techniques and people can see the importance of what we do. Ben - Beyond the technology borrowed from surgery and dentistry, what have you had to develop in order to meet your challenges? Graeme - I think sometimes the means of getting there, so we have the vision systems, but sometimes it's actually getting something into the area that we need to get to. So it's often using specially made guide tubes and bespoke equipment to actually help drive the equipment to where it needs to go. Ben - So when there isn't a tool that already exists, you're forced to develop a new one and actually build something that fits the situation. Graeme - Yeah, and I think that's the beauty of the job really that we're given the problem, we go to a training engine and we look at the access, we work out how we're going to do it, we make prototype tooling and obviously see if it works in the engine. If it does then we train teams up to go out and deliver the service. Ben - James, your job is more on the R&D side of this actually, developing the new tools. What sorts of challenges do you face? James - It's similar to Graeme in effect that we've still got the same environment that we're looking at, but it's my job really to monitor the technology that's out there to start with. If we've already got something that's almost developed and it's not quite to our needs, we can maybe modify it so that we can use it in the same environment. So that means, I'm looking at things like medical conferences and journals for that kind of thing, and also robotics, and the conferences and journals on that as well. Ben - It seems that you have the full range of the world of science and engineering to pick from in order to find the right tool. James - The idea, in a way, is to try and maybe in 50 years, we'll be able to miniaturise the whole of the maintenance and overhaul facility and be able to do all of those things whilst the engine is still intact. Obviously, that's quite a way ahead and there's always going to be some things that we can't do whilst the engine is still in one piece. But I think the idea is really to look at things that are out there and develop those things so that they can be used. So there's all sorts of things that we're trying to use and laser technology is one of those areas that we're investigating quite heavily and also robotic equipment. So the idea is to try and brush your teeth when you're in the upstairs bathroom if you're stood at the letter box outside. Ben - So how does the process work? Graeme would say to you, "I need to find a way of getting to this particular component." How do you then step into action? James - There are two different ways I might get involved. There's me thinking of a blue sky wacky idea, floating it past Graeme, seeing whether he thinks it's got merit (and he's shaking his head at me). The other option is for some problem that we know is coming down the line for example in an engine that's being built at the moment but not necessarily in service, where we've got the luxury of perhaps a year or two to actually develop a technique. A good way of thinking of it is we've got a push of technology where I think of a blue sky idea or we've got a technology pull where people like Graeme know there's a problem out in the world and we got to try to think of a way of solving it. Ben - So, in the future, what would you hope to see to make your life easier, to make these developmental tricks easier? James - The ultimate thing for us would be an engine that you could take apart and still not have to worry about going in through a very small hole which is around 9 mm. You can maybe lift off a panel and expose a whole array of different components. That's a significant design challenge and probably not one that we can entertain anytime soon. Ben - And Graeme, what do you see as being the tools of the future that you would really like to see developed? Graeme - I think James eluded to this already in terms of laser type technology and miniaturised robotics. I think they are the two key areas that we're looking to invest in and develop. Ben - Graeme Rigg and before him James Kell, both from the on-wing capability team at Rolls Royce.